To Cite: Enomoto H, Nishikawa H, Ikeda N, Aizawa N, Sakai Y, et al. Improvement in the Amino Acid Imbalance in Hepatitis C Virus Infected Patients After Viral Eradication by Interferon Treatment, Hepat Mon. 2016 ; 16(6):e35824. doi: 10.5812/hepatmon.35824. Background: In patients with chronic liver diseases (CLDs), hepatitis C virus (HCV) infection in particular may cause various metabolic disorders. We previously reported that the value of the ratio of branched-chain amino acids to tyrosine (BTR) decreased with the progression of liver fibrosis. Objectives: We investigated the changes in clinical variables during interferon (IFN) treatment and assessed whether HCV eradication improved the amino acid imbalance in HCV infected patients. Patients and Methods: We retrospectively collected the clinical data of HCV-related CLD patients whose BTR values had been measured both pre- and post-IFN treatment. A total of 17 patients with a sustained viral response (SVR) (mean observational period: 1085.0 days) and 19 patients without an SVR (Non-SVR) (mean observational period: 1002.5 days) were studied. Results: In patients with an SVR, the serum levels of aminotransferases were decreased after HCV eradication. Although general liver functional tests (albumin and total bilirubin) did not significantly change, the BTR values significantly increased. However, in patients without an SVR, an improvement in the BTR value was not observed after IFN treatment. Conclusions: HCV eradication can improve the amino acid imbalance in HCV infected patients. In patients with liver cirrhosis, the serum levels of branched-chain amino acids (BCAAs), such as valine, leucine and isoleucine, are decreased, while those of aromatic amino acids (AAAs), such as tyrosine and phenylalanine, are increased. A decline in Fisher’s ratio (serum ratio of BCAAs to AAAs) is thus considered to reflect the amino acid imbalance in cirrhotic patients (1, 2). The ratio of BCAAs to tyrosine (BTR) has also been shown to decrease in cirrhotic patients, and BTR is widely used in Japan as an easily measurable indicator of amino acid imbalance (3, 4). In patients with chronic liver diseases (CLDs), hepatitis C virus (HCV) infection in particular may cause various metabolic disorders. Regarding the amino acid imbalance, we previously reported that the BTR value decreased with the progression of liver fibrosis in patients with HCV-related CLD (5). However, the changes in the BTR values after HCV eradication by interferon (IFN) treatment have not yet been clarified. In the present study, we investigated the changes in patients’ BTR pre- and post-IFN treatment and assessed whether HCV eradication could improve the amino acid imbalance in HCV-infected patients. We retrospectively collected the clinical data of 36 HCV-related CLD patients who completed IFN treatment from December 2006 to August 2012 and whose BTR values had been measured at two time-points (within six months before the initiation of IFN treatment and more than one year after the completion of IFN treatment). HCV infection was diagnosed by the detection of HCV antibodies and HCV RNA in the patient’s serum. Patients with undetectable levels of HCV RNA at 24 weeks after the end of IFN treatment were defined as patients with a sustained viral response (SVR) and were regarded as those who achieved HCV eradication. A total of 36 HCV-positive patients treated with IFN therapy were included in the present study (PEGylated IFN plus ribavirin therapy: 22 patients; IFN plus ribavirin therapy: 3 patients; PEGylated IFN monotherapy: 4 patients; and IFN monotherapy: 7 patients). Patients who received BCAA treatment were not included in the study. The BTR values were measured using a commercially available kit (Daiyacolor-BTR, Toyobo, Osaka, Japan) (6, 7). 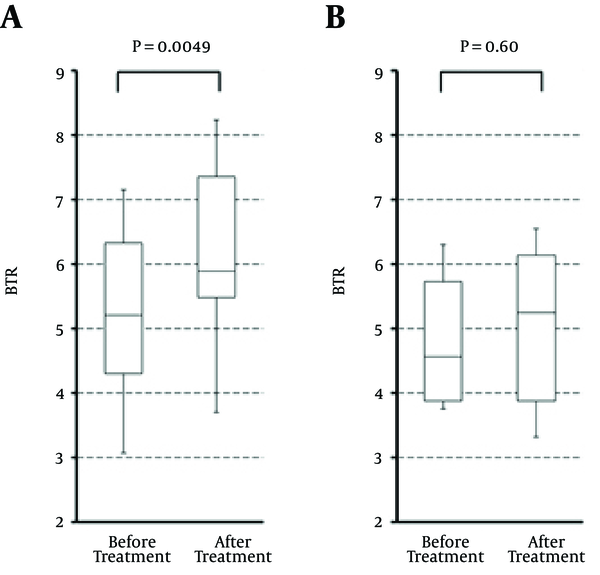 In addition to the BTR values, basic clinical variables were also collected and changes in the values pre- and post-IFN therapy were investigated. This study conformed to the ethical guidelines of the Declaration of Helsinki, and written informed consent was obtained from all patients. In the present study, we attempted to clarify whether the BTR value improved after the achievement of SVR. We also assessed the changes in general clinical variables in patients with CLDs. numerical variables were expressed as the median values (range) and their changes pre- and post-IFN therapy were evaluated using the Wilcoxon signed-rank test. A total of 36 patients (including 11 cirrhotic patients) were studied; 17 patients achieved an SVR (“SVR” patients), while the remaining 19 patients did not (“non-SVR” patients). Twenty-eight patients and eight patients, respectively, presented with infections of the genotype 1 virus and genotype 2 virus. The characteristics of the enrolled patients and changes in the general laboratory data are shown in Table 1. When we investigated non-SVR patients, the levels of various CLD-related variables did not improve after receiving IFN treatment (mean observational period: 1002.5 days), perhaps due to liver inflammation during continual HCV infection. When we evaluated SVR patients (mean observational period: 1085.0 days), the levels of aminotransferases and gamma-glutamyl transpeptidase were significantly decreased after HCV eradication. The serum levels of general liver functional tests (albumin and total bilirubin) were maintained but did not significantly improve even after HCV eradication. However, the BTR values were significantly increased in SVR patients, but not in patients without an SVR (Figure 1). Abbreviations: AST/ALT, alanine/aspartate aminotransferase; DM, diabetes mellitus; GGT, gamma-glutamyl transpeptidase; HT, hypertension; SVR, Sustained viral response. aData were expressed as median (range), unless particularly mentioned. b**, P < 0.01 and *, P < 0.05 determined using the Wilcoxon signed-rank test. The BTR values in patients with an SVR significantly increased (A), while those in patients without an SVR did not significantly change (B). Box plots: 10th percentile, 25th percentile; median, 75th percentile and 90th percentile. As the liver plays a principal role in metabolism, several metabolic functions have been shown to deteriorate with the progression of CLDs (8). Amino acid imbalance is one such metabolic disorder in patients with CLD (9), and previous studies, including from our group, showed that a decreased BTR value was related to the severity of liver fibrosis in CLD patients (5, 10, 11). In 2007, Kawaguchi et al. showed that insulin resistance was improved in patients with an SVR (12). In this study, we showed that the BTR value increased in response to HCV eradication following IFN treatment, suggesting that the BTR value may be a sensitive indicator of metabolic change in SVR patients. This is the first report, to our knowledge, to show the improvement in the amino acid imbalance after HCV elimination by IFN therapy. There are some limitations associated with the present study. First, this is a retrospective study, and the treatment protocol and observational period differed for each patient. Second, the BTR value, the indicator of the amino acid imbalance, is not routinely measured before and after IFN therapy, so the number of patients included in this study was small. However, irrespective of various clinical conditions, SVR patients showed increased BTR values following IFN therapy, unlike non-SVR patients. Therefore, the improvement in the amino acid balance may be a generally observed condition in SVR patients. Although we were unable to evaluate the association between changes in the BTR and changes in the histological findings because of the limited number of patients with liver biopsy after HCV eradication, it would be interesting if the increased BTR values were related to histological improvement. A prospective study with a greater accumulation of cases will provide definitive information. In summary, we showed that the BTR value was increased in HCV-eliminated patients. Although several metabolic disorders develop in CLD patients, the amino acid imbalance has not been sufficiently studied, particularly in non-cirrhotic patients. Our findings provide new information regarding metabolic disorder in non-cirrhotic HCV infected patients. We are grateful to Tawara N., Nakatani R., Wasai K., Kanazawa N., Matsushita Y., Fujii S., Kido H. and Minemoto K. (Hyogo College of Medicine) for their technical and secretarial assistance. Authors’ Contribution: Hirayuki Enomoto and Shuhei Nishiguchi: designed and proposed the research; Hirayuki Enomoto, Hiroki Nishikawa, Naoto Ikeda, Nobuhiro Aizawa, Yoshiyuki Sakai, Kazunori Yoh, Ryo Takata, Kunihiro Hasegawa, Chikage Nakano, Takashi Nishimura, Akio Ishii, Tomoyuki Takashima, Yoshinori Iwata, and Hiroko Iijima: participated in the clinical practice and acquisition of data; Hirayuki Enomoto and Hiroki Nishikawa: performed the statistical analysis. Hirayuki Enomoto and Shuhei Nishiguchi: drafted the manuscript. All authors were involved in the manuscript revision and approved the final version of the manuscript. Financial Disclosure: Shuhei Nishiguchi received financial support from Chugai Pharmaceutical, MSD, Dainippon Sumitomo Pharma, Ajinomoto Pharmaceuticals and Otsuka Pharmaceutical.